4th Annual West Coast Urban Sketchers Sketchcrawl in Tacoma, Washington! 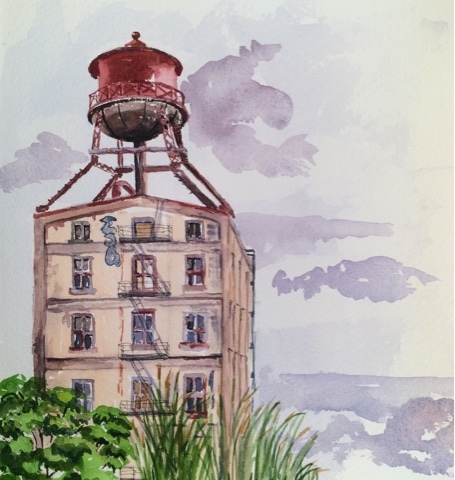 Join us next summer in another fabulous west coast city, Tacoma, Washington, for the fourth in a series of annual west coast urban sketchers sketch crawl events. 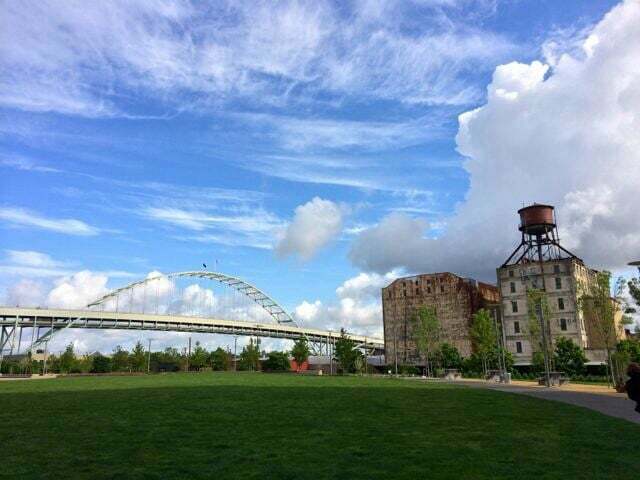 We have been in the San Francisco Bay Area, Portland, and San Diego over the past three summers, and this coming summer we offer up Tacoma, the second largest urban area in the state of Washington. 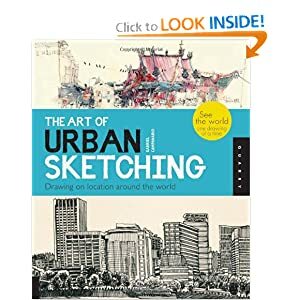 Tacoma offers an historically and architecturally rich downtown area that cries out for the sketcher/artist to pay it homage. 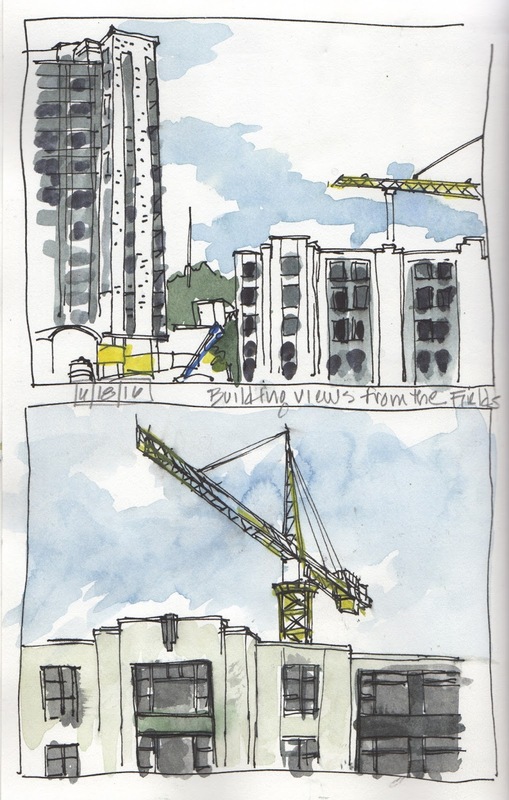 I haven't posted here for awhile but since I just came to the last page in my sketchbook, I thought I would post a few recent sketches before I consign them to the shelf. 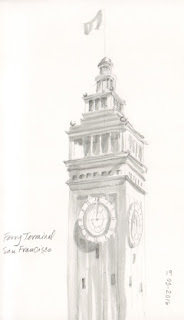 This is the Ferry Terminal in San Francisco, drawn lightly in pencil, then the shadows added with a water brush filled with watered down ink--thanks for the tip, Deb, it was a great time-saver for this slow sketcher! 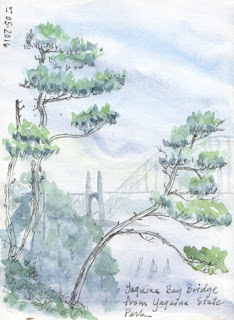 A foggy day at Yaquina Bay...hmmm sounds like a song, doesn't it? 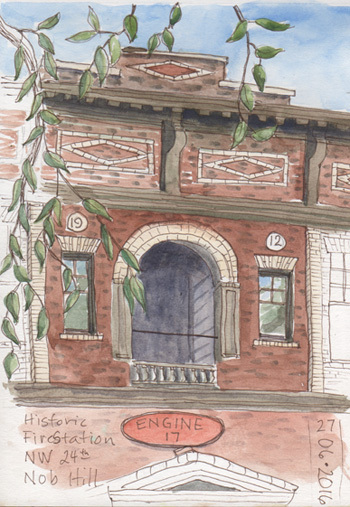 This apartment building on Glisan is just one of the many beautiful historic brick buildings in Portland. These old fire houses are another example of fine brick-work. This one is transitioning into a residence. 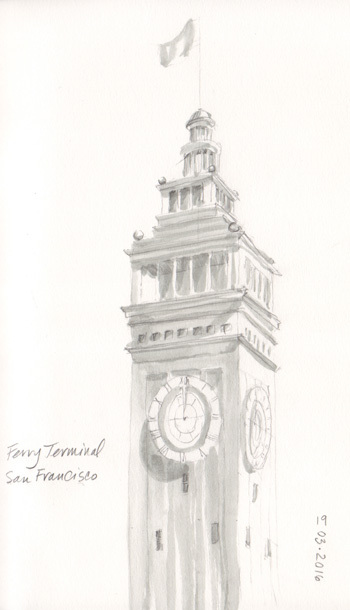 Well, now its time to face the blank pages of a new sketchbook--I'd better get busy! 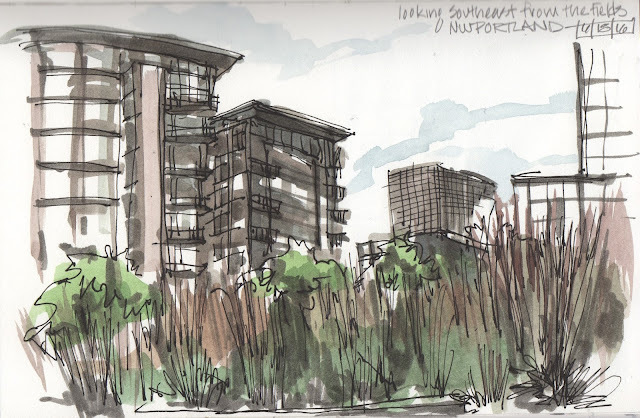 It was an enjoyable meetup with the urban sketchers on Saturday! I enjoyed meeting so many new people. However, the weather was a lot better this morning when I returned to finish my sketch. I had put down Saturday's gray clouds already though the sky was blue today. I have sketched this building several times before and I always enjoy it. I've often been to the Fields to sketch, most recently to watch some of the buildings across the railroad tracks being demolished. Today I realized that, due to that demolition, you can now see the grain silo across the river. There certainly were some dramatic, and changing, clouds out this morning. 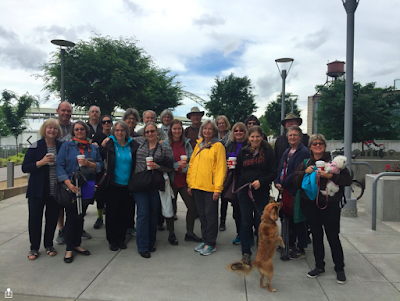 Here's a photo of most of the sketchers (and a couple of dogs) who were at today's sketch crawl. 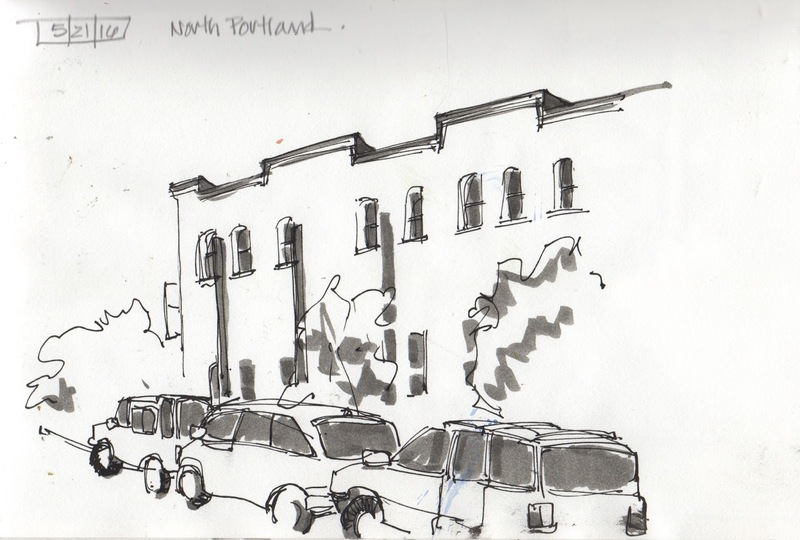 It was nice to have several newcomers as well as people who sketch with us occasionally and the regulars. This photo was taken at the start, when most of us (in true Portland style) had loaded up on coffee and were ready to make the most of the morning before the weather changed. I only got in one sketch in the time that Deb managed to fill three pages. (I need to watch how she does her magic.) I know I spent some time just watching the clouds change, reflected in the glass of the new high-rises that surround the park. Our timing was perfect and we finished up just as the rain started. We shared conversation, lunch and sketchbooks under the umbrellas at the Ecotrust building. It's always a pleasure to chat and see everyone's sketchbooks in person and, like I heard at lunch: it's always a little sad when it's over. I hope to see you all at next month's sketchcrawl. 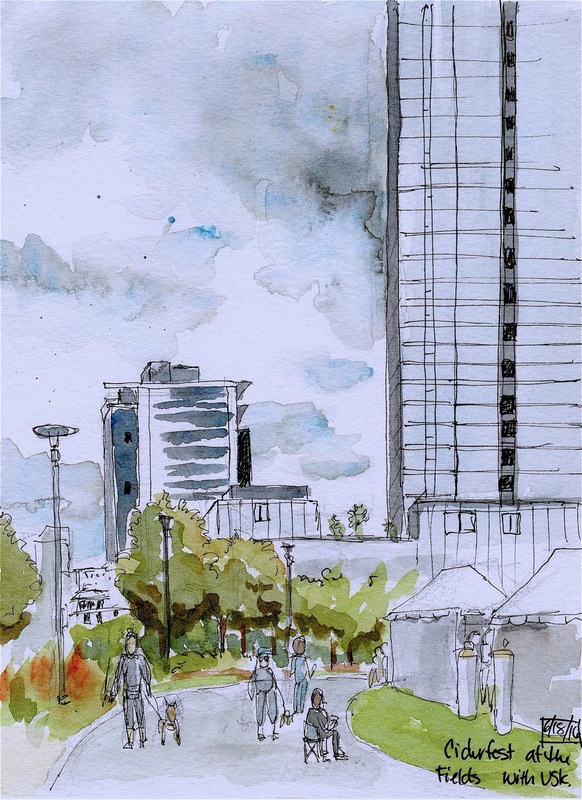 A very nice group of urban sketchers arrived at the Fields to sketch today. The park was filled with activity; like the Ciderfest, children in the play area and people with their dogs. 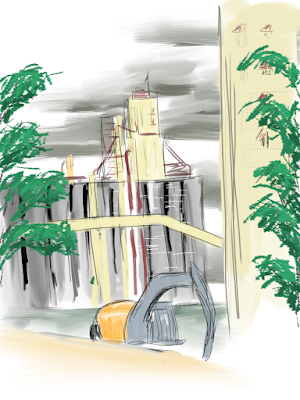 But typically I ignored all that and instead looked out toward the buildings and construction! The morning sky started out blue with white wispy clouds and then progressed to darker grey clouds with just a bit of wispy white. 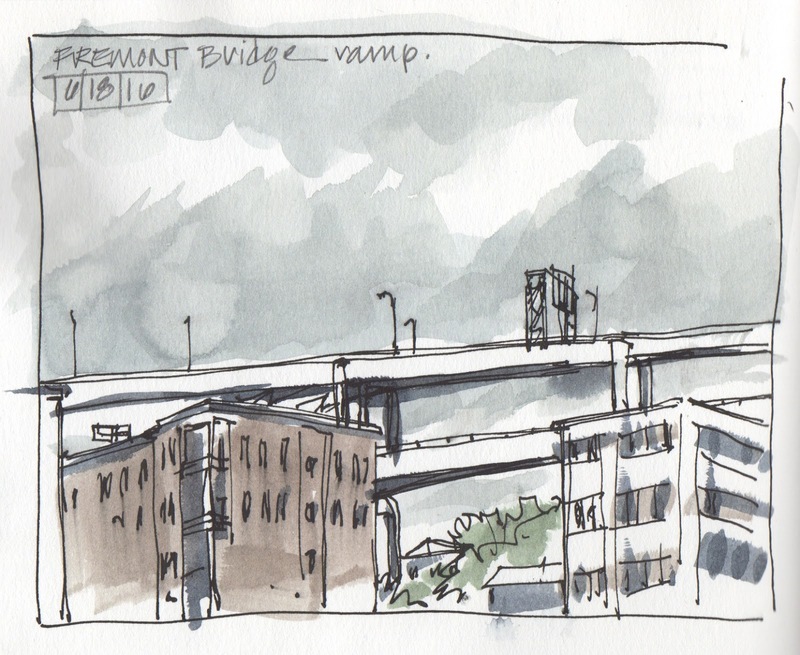 I tried to capture some of that in this last sketch as it started to rain. Just catching up on posting these from our May gathering. 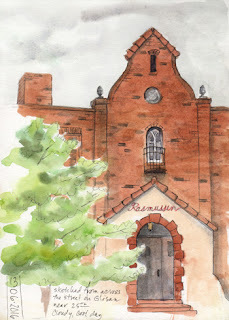 I spent a bit of time inside Broder Nord enjoying a breakfast (cheese and fruit fritters...yum!) 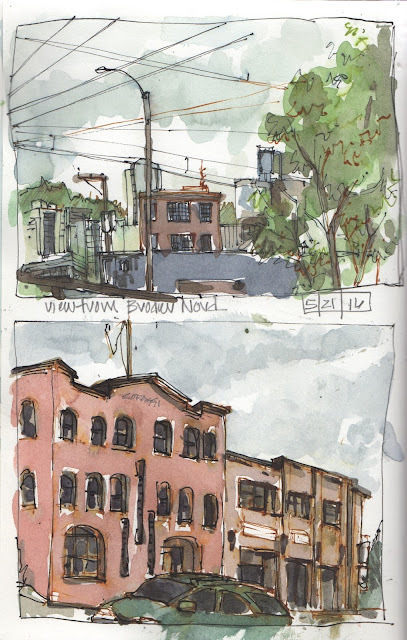 and sketching out the window toward this very interesting industrial area of Portland. Somehow I used up a lot of the time and only had a bit left (before we met at Widmer Bros to share) to do another sketch of the Coraggi building (the one next to Broder Nord).